A developer provides a tutorial on how to create a complete component chain for a web app using Koin, a Kotlin declination. 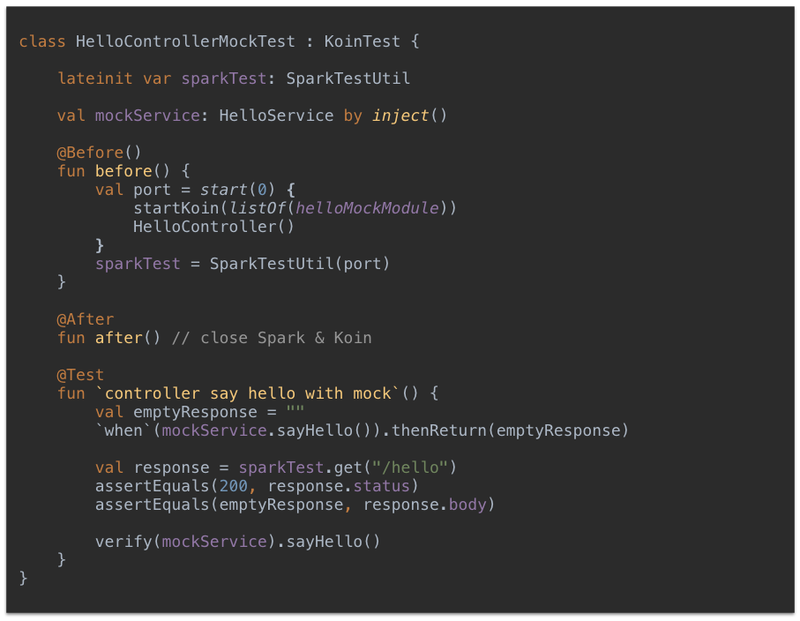 SparkJava has now its Kotlin declination and continues to assert its ambition for developing web apps in a smart and simple way. This state of mind matches perfectly with Koin’s philosophy: simplicity of writing and smart APIs. In the simplest case of writing a Spark web app, you can start directly with your HTTP route declaration with just get("/hello"). I would like to go beyond that case, as it is a bit simple, and try to make a more complete component chain (a Controller, a Service, and a Repository) with all of those components assembled behind Spark with Koin. A Controller to handle HTTP routes and return results from the service. A Service to handle business and take data from the repository. A Repository to provide data. Sources are available in the Koin’s GitHub repository. Let’s go! You can check here to see how I provide this way of starting Spark. This can be easily reused for testing. Our Service and Repository are decoupled with interfaces. And each implementation can be injected by its constructor (injecting via a constructor is the most recommended way of preparing dependency injection). HelloController is tagged with the KoinComponent interface to allow the usage of by inject(). This interface is needed when you can't directly create components with Koin and must bind with a runtime or an SDK. That’s it! You’re ready to go. Test Controller with a complete application. Test controller with a mock service. Test the service and repository. Koin is your perfect companion to write applications with SparkKotlin. All sources are available in Koin’s GitHub repository. Go play with it!